If you can believe it, [I know some won’t believe me!] not all of the movies I enjoy are in the horror genre. Sometimes, they fall under drama or even sometimes action. Or in the case of today’s underrated movie; both drama and action. This movie is none other than Léon The Professional. The movie follows Léon, a hit-man [who calls himself “a cleaner”] who is the best at what he does — all while drinking milk, watering his plants and listening to music. occasionally, he sees his young next door neighbour [he lives in an apartment, probably to keep his profile low] who is clearly abused physical and mentally] at home. This neighbour is none other than Mathilda and is played wonderfully by the beautiful Natalie Portman [though, she was 12 in this film!] The story officially kicks off when SPOILER ALERT!] Mathilda‘s family is brutally murdered in a drug related incident. It’s in this moment that Mathilda turns to her quiet neighbour Léon to let her into his place where she learns who he really is. Like most people in that scenario, Mathilda wants revenge on the guys who killed her family [though only for her younger brother, no one else] and enlists Léon to teach her how to become a “cleaner”. What makes this film so special is it feels like there’s nothing like it — a young girl wanting revenge on killer and then finding herself [believing] she’s in love with a quiet neighbour who is actually a hit-man, you wouldn’t expect this film to fall into such things! In fact, it’s almost ‘cute’ in the way Léon and Mathilda interact. [“drink your milk, Mathilda”] Because she’s so young, Mathilda gets herself in trouble and her hero: Léon has to come and saves the day! The whole film is just numbing with it’s acting and it’s cinematography. Just the atmosphere of the film alone is captivating! It really does deserve such a high spot on IMDb‘s list of top 250 films of all time. It’s even directed and written by Luc Besson – who also made The Fifth Element so that alone should tell you something. As I’ve said in the past — most characters that I tend to relate to are [extremely] fallible. They’re like a “fallen hero” who’s gone through such immense struggles that they almost have to push through, because then they’ll feel like they have accomplished what they set out to do. Characters like Léon come off as okay, because he’s a hit-man, but in reality [probably from making so many enemies over the years] he struggles to sleep at night; out of fear of someone coming into his apartment. He also doesn’t know how to read [never learned, I guess?] 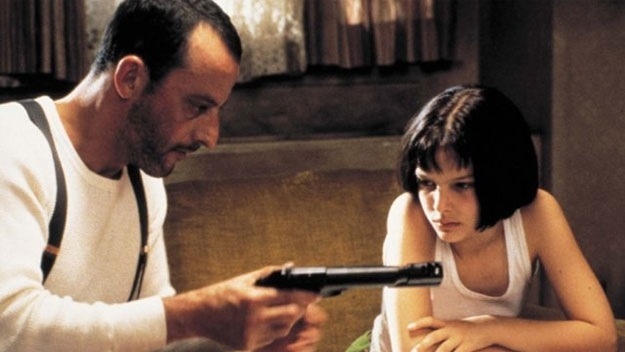 so in a way, Léon needs Mathilda to survive as Mathilda needs Léon. I definitely recommend this film if you can find a copy of it somewhere [I don’t think it’s out of print.. I mean it shouldn’t be] it has an extremely strong storyline with fantastic characters and has Natalie Portman in her first feature role — at the age of 12! The end of the film will definitely tear at your heart strings a little, but that’s what makes it so damn special: it’s relatable. So do yourself a favor and watch Léon The Professional, I promise it’s storyline alone will have your attention enough to continue watching! fun fact, the quote at the top of warrenisweird under the title is from this exact film! When you think the term ‘horror icon’, who do you think of? Freddy? Jason? maybe even Michael Myers or Ash from Evil Dead? well, how would you react if I told you of another icon? someone no one has really heard of. He uses a farming scythe as a weapon, and loves an audience.. his name is Leslie Vernon: this guy – here. But the best part of this film isn’t that it’s a horror, not the fact that it’s a ‘mockumentary’; but the fact that there is so many familiar faces that appear in the film! From horror fan favorites like Kane Hodder, Zelda Rubinstein [RIP], and even Freddy himself – Robert Englund; this film is bound to attract the horror fan in all of us; that is what makes this film so damn special. Unfortunately, the film ends on a cliffhanger. and although a sequel/prequel: aptly called Before The Mask: The Return Of Leslie Vernon has been planned [for almost 2 years now..] ,the writers/director is struggling to make ends meet to make it happen. There was a Kickstarter set up for it as well, but that closed when they only reached about 40% of the money they were hoping to get. The only real saving grace we have on Leslie‘s return is that Robert Englund has officially stated that he will be returning for it – regardless of it’s current situation. cone on Leslie, come wreak havoc on the town once more.. So if you’re into horror, I strongly recommend this film. It’s also on Netflix so you have literally no excuse not to see it [unless of course, you don’t like horror] It’s fun, it has scary moments, and it has a lot of familiar faces! I guess only time will tell if we get to see Leslie go on another killing spree. Especially since it’s struggling to be made. I have strong hope that it’ll pull through, even it only lands on DVD/Blu-Ray; I just need more Leslie Vernon in my life.. The Rise Of Leslie Vernon made sure of that.